A placeable not being interactive, companion attribute bonuses not appearing on the talent/skill (I think I may need to create entirely new custom abilities for this, however that is done), enemies not moving towards the player to attack (they spawn at a distance and are supposed to run towards the player), assorted scripting/tagging/plot logic errors, combat difficulty tweaking, fixing up codex entries for various items/areas/people, and a few other things besides. The point here is to iron out all the issues in the opening few hours of the mod so I can potentially release a closed alpha/beta to a small group of willing testers in the near future. There's still lots of work to be done on the project as a whole (and there's still missing VO even in this prologue section), but I'd certainly love to here some independent opinion on the beginning of The Shattered War. Let me know if you're interested - an email to my gmail address (it's my "name" [the one in the graphic above] at gmail.com) would be fine - and I'll be in touch. In closing, I thought I'd give a shout out to MiracleOfSound (aka Gavin Dunne) on the Escapist. Producing a new song every two weeks isn't a straightforward task, so when they're both pretty good, and game related, I can't help but love this work. Admittedly I was a fan ever since he told us we would never be better than Commander Shepard, but I really like his latest work, and like everything of late, it's all about Skyrim. 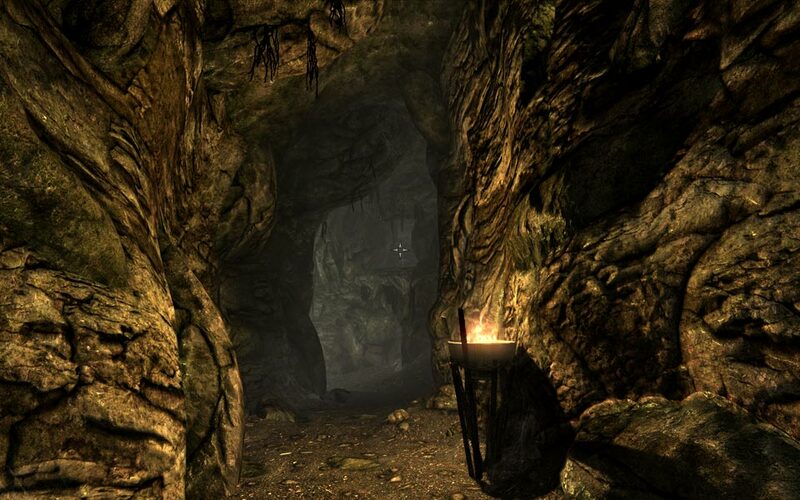 In my last post, I talked about some of the areas where games could learn from Skyrim in terms of its successes. In this post, I'd like to discuss some of the game's shortcomings. Wait, you can get HOW powerful? This has been a problem with Elder Scrolls (arguably Bethesda games in general) since Morrowind. As you get higher in levels, you can become obscenely powerful. It's not just that you become better as a player (which will arguably have some effect) or that you get better gear (which you will), it's the manner in which you can improve or create gear or your skills to the point where you become unfathomably powerful. It's possible to enchant items to reduce the cost of destruction spells. These enchantments will stack across multiple items, potentially allowing you to decrease the cost of destruction spells (to unleash fire, ice or electricity upon your opponents) by 100%. That's right, with a high enchanting skill, you can cast offensive spells for no mana. Alternatively, maybe you'd like to increase your smithing abilities so you can create better weaponry. 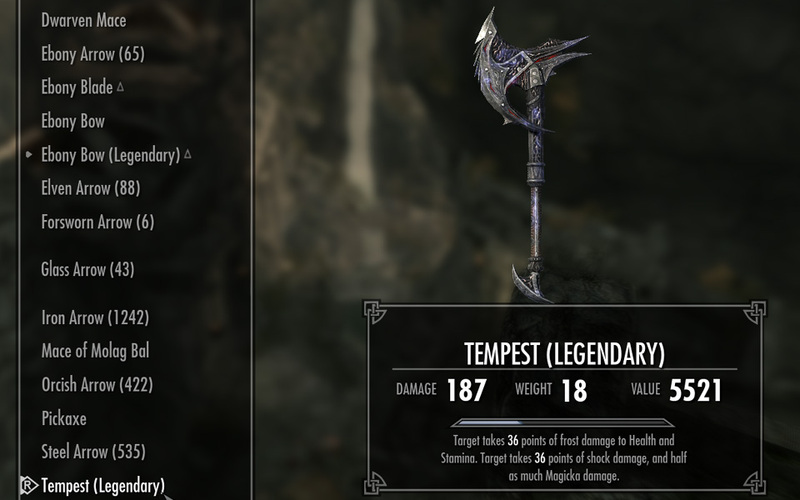 Well, if you get your smithing up to maximum level and improve items, you can end up with incredibly damaging weapons at your disposal that can dispatch any enemy in only a few hits. Sure, the player can choose not to pursue these skills, but if they decide to, they don't necessarily realise how broken and overpowered these options are until it is too late. Then once the player has created and named their own custom set of enchanted armor and weapons, they can hardly be expected to just "give them up" simply because the designers failed to balance the game to cater for players who chose these pursuits. There are scaling issues for the opposition as well, though I wonder whether these might be bugs. A few times I faced an occasional quirks where one enemy would be vastly more powerful than its counterparts with exactly the same name (and hence theoretically should be the same level and roughly the same difficulty). In one case, a Falmer skulker (a low level archer) would kill me in a single hit if my health bar wasn't on absolute maximum. Not two enemies later, I found another Falmer skulker than did negligible damage and I could have taken about 8 arrows from him before I died. Even in my low 40s I encountered a random bandit that launched fireballs with utmost haste and I was dead before I even managed to get a bead on where he was shooting from. 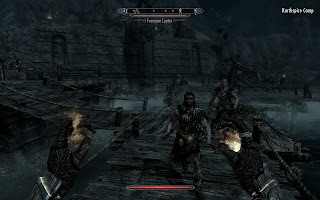 Fortunately in the latter case, a reload resulted in his replacement enemy being "normal", but the Falmer Skulker proved to be a very tough and annoying enemy to defeat. Even at a high level (52), I've faced a couple of opponents that killed me in one hit while decked out in full dragonscale armor, and I've got a bucketload of armor increasing perks. Now, while I appreciate the concept that there are still enemies out there who could potentially be a threat to me, it simply doesn't make sense for some random vagrant in a hideout presenting more danger than some of the named "epic foes" of the game. Is this Forsworn going to one-shot me? Who knows? The real joy of the game comes from exploration. When you reach the point where you want to just go around completing quests, the game becomes a little bit more tedious than the heights of excitement that it offers. Once you've explored vast amounts of the map and are just looking to complete some quests, it becomes a simple matter of "Pick up quest at point A", "Fast travel to point B to have conversation", "Fast travel to point C to kill a few enemies", "Fast travel to point A to complete quest". Without the exploration aspect, quest completion often becomes a very straightforward process that doesn't hold a whole lot of surprises or intrigue. 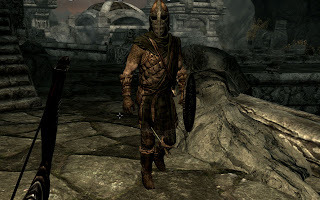 The Elder Scrolls games focus on a massive breadth of content, and that is their strength. You have the freedom to explore pretty much anywhere and choose to do (or not do) what you wish. The problem is that while every player ultimately has a different experience because of that freedom, that freedom means that there is very little or no "small scale" freedom in determining how each of the "mini-adventures" play out. For the majority of quests, everyone will have the same experience in how the interactions and results play out, with the differences coming from the style of combat that the player chooses or the route they travel to reach their destination. There's no real replay value for individual quests, but merely replay value on attempting different combat styles, which as I've mentioned, you can potentially explore entirely in a single playthrough anyway. In same cases there are some minor choices which affect how things play out, but these are by far the exception rather than the rule. Even the dialogue roleplaying aspects are notably shallow, and your character is mostly a blank and shallow creation which has to follow many of the same lines regardless of personality. Given you are playing the voiceless dragonborn, it's up to you to inject personality into your character, because the game offers very little input into that aspect of roleplaying. You have a choice of what quests you will do in the world, but virtually no choice as to how you complete them. One of the more notable problems relating to the immersion of the world is how it reacts to you. The problem here isn't that the characters don't react to you, because they do. It's that they don't react to you in a consistent manner. 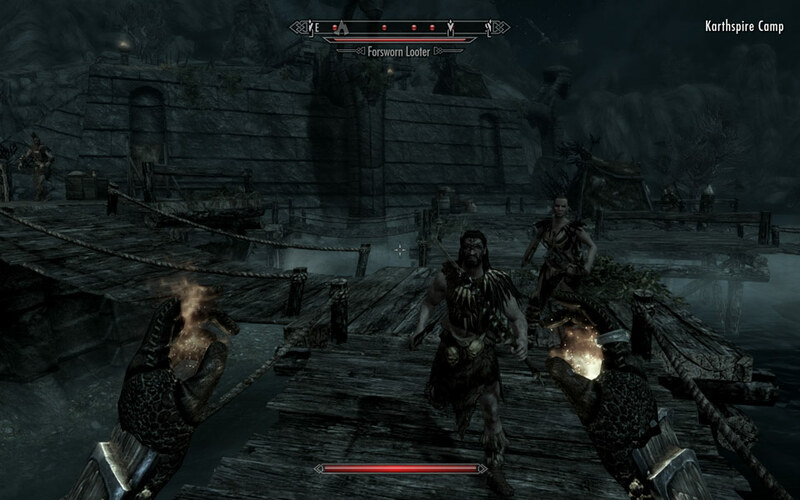 Town guards can notice me walking around with Azura's Star (a daedric artifact), yet Vigiliants of Stendarr (who hate daedra worshippers) won't bat an eyelid when I walk past them carrying the same daedric artifact, or even a daedric weapon from a daedra they consider to be (very) evil, even when I'm wearing armor from a different and also evil daedra. People from the other side of Skyrim will say "You're that made from College, heard about you", yet Farengar from Whiterun will keep telling me I should join the mages college if I have the aptitude, even though I've been the archmage for a couple of months. Or there's the guards that make fun of me being responsible fetching the mead for The Companions even though I've been their leader for even longer. These issues aren't entirely dealbreakers, but they are shortcomings of the game's design. Skyrim makes half-hearted attempts to address these issues, but as a result doesn't manage to satisfy the player in these areas. The balance is askew, choice is minimal at best, and the world has the bizarre situation of paying lip service to your actions without ever reacting to them properly. My apologies for being a little quiet on the blog front lately. I should reassure those eagerly awaiting the release of The Shattered War that I have actually been putting some time into modding. 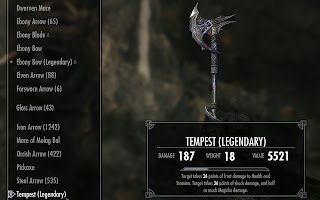 It is time, however, to take a closer look at some aspects of design of the recent success that is Skyrim, and look at those things that did and did not work. In this post, I'll examine some of the design issues that other games can learn from. Art Design aka "It's not all about tech"
There is no denying that Skyrim is a beautiful game. People are taking time lapse "photography" of the game because it simply looks that good. Now, while many will attribute this to the "graphics", which is the technical wizardry behind the graphics, this isn't why the game is so jaw-dropping. Compare it to Crysis 2, which technically is a gorgeous game, but from a design point of view there weren't a lot of those moments where you just stopped and went "Wow, that's gorgeous." Skyrim, despite not having all the bells and whistles of the best Anti-aliasing, shader effects, glorious reflections and refractions, real-time realistic shadows, DX11 tesselation, or the myriad of other features offered in some technically superior games, simply looks attractive. It doesn't have the highest resolution textures or the best level of detail distance gradient handling, but it just downright looks good. The reason Skyrim looks so good is because of the effort made to create a beautiful world where there are particular artistic styles and themes throughout. The terrain covers alpine forests, rolling hills, badlands, swamps, rivers cutting through chasms, ice floes... there are so many different types of terrain but each presents a cohesive visual style and this is supported by the flora, animals, weather and even enemies that you encounter in those areas. This applies to the interiors as well, each of which adhere to a consistent style, but have their own unique elements. The Dwemer ruins in particular have some absolutely spectacular scenery; it's likely that you've never seen dwarven ruins that look this good in any medium. The aesthetics of level design are not the only aspects that should be credited here, but also the functional aspects of levels. 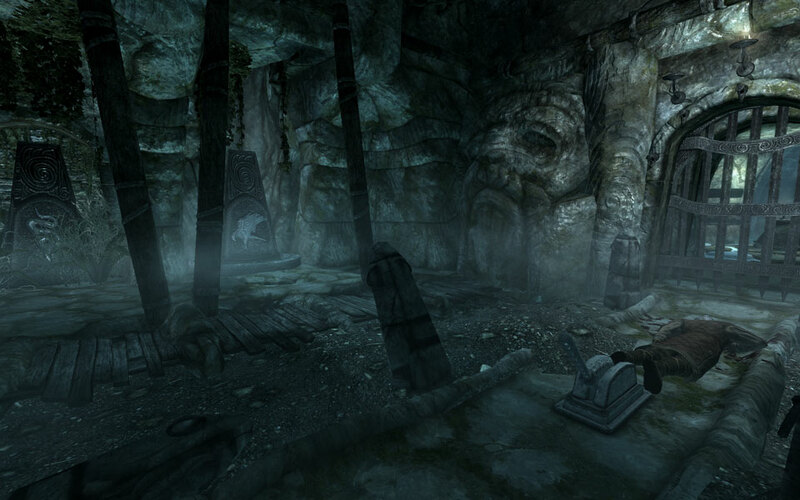 Interiors, in particular is an area where levels have typically been designed very well. Backtracking is a problem that results in tedious gameplay of passing over empty areas when you force the player into an area within one way in and out. 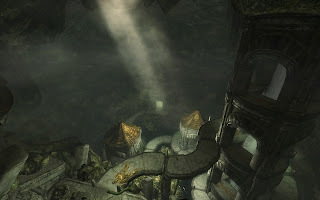 The obvious means to solve this problem is to have an exit when the player reaches the end, though this the designers must mean that this cannot be an alternate entrance to the area that an adventurous player could potentially find and short-circuit the entire dungeon. Skyrim does manage to do this, and it is quite effective. Perhaps even more impressive and interesting is the manner in which many dungeons are created with only a single entrance/exit, but are created as a closed loop. The player follows a set path to reach the final boss/treasure room, but continuing after this will result in the player looping back to a location very near to the entrance of the interior. Even more successful is that this is done in a variety of ways, so it doesn't ever feel particularly stale or overly contrived. The "exit path" joins is blocked off from the entrance path by a number of ways: sometimes a barred door or unopenable gate, sometimes a secret door, other times a high ledge that is impossible for the player to reach. This loop system, in conjunction with areas that do have a separate entrance and exit, means that design of interior levels is both interesting and functional. Skyrim shows how puzzles in games can be done really well. These puzzles aren't minigames. They aren't alternative game mechanics. They're elements within the gameworld that are integrated in a fashion to present the player with a simple mental/visual challenge in order to proceed. Fairly early on in the game, you'll likely stumble across a door with three rings with symbols open them, which can apparently be opened by a claw. While this initially might seem like an issue of trial and error, you'll quickly learn that the claw holds the key to the correct sequence of symbols. This puzzle becomes trivial once you know the solution, but it's a near seamless way to include puzzles into the game. Traps are visible and possible to avoid if you as the player are attentive, as opposed to a random die roll that determines whether your character can see them. While this isn't new, the traps are such that you actually do care about them because they can do a lot of damage or kill you outright, but also because you can quite easily use them to destroy unwitting enemies. This is a refreshing change from things like the paltry shotgun traps of Fallout 3 that were really of little consequence except for providing you with repair fodder/ammo. There are symbol alignment/placement puzzles and lever switching puzzles that are also fairly easy to solve for the attentive and/or logical player, but the real joy is that you feel like you're interacting with the environment itself. There's no BioShock pipemania, no Mass Effect 1 Simon, no Alpha Protocol "findaword". It's simply a matter of observing the gameworld and interacting with it directly. It almost feels like a pity that the lockpicking mechanic is akin to those from Fallout, for this pulls you out of the gameworld in a way that the puzzles do not. 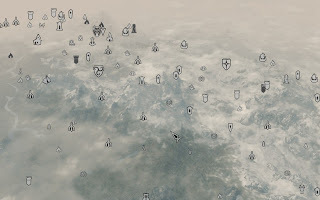 Now, while these are aspects of Skyrim that I thought deserve a positive mention, there are some places where Bethesda still come up a little short. I'll be looking at a few of those areas in my next post.